On Tuesday, shares of Tata Motors Ltd fell 1.18%, or ₹ 3.15, to ₹ 264.15 on the BSE. 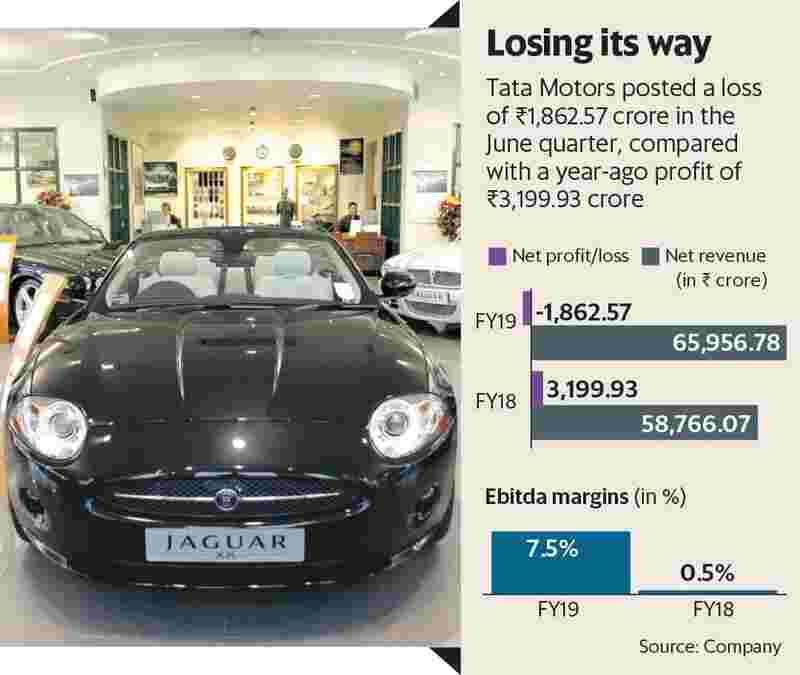 Mumbai: Tata Motors Ltd, India’s largest automaker by sales, turned to a surprise consolidated quarterly loss, weighed down by a tepid performance at its British unit Jaguar Land Rover (JLR) Automotive Plc. The Mumbai-based auto maker posted a loss of ₹ 1,862.57 crore in the three months through June, compared with a year-earlier profit of ₹ 3,199.93 crore, it said in a regulatory filing. It was the firm’s first quarterly loss in three years, and the worst since a ₹ 2,598.83 crore loss in the December quarter of 2008. A Bloomberg poll of 10 analysts forecast Tata Motors to post a net profit of ₹ 909.1 crore. Slowing sales in China—JLR’s biggest and one of its most profitable markets—hit earnings in the just-ended quarter. Consumers in the world’s largest automobile market deferred purchases during the April to June period ahead of the reduction in import taxes from 1 July, Tata Motors said. Sales in China grew a marginal 2.5% last quarter to 34,358 units. As a result, JLR turned in a quarterly loss of £210 million (about ₹ 1,900 crore) on a 6.7% drop in sales to £5.2 billion (about ₹ 47,000 crore). Global retail sales of the maker of Jaguar F-Pace and Range Rover Evoque sport-utility vehicles rose 5.8% from a year earlier to 145,510 vehicles last quarter. The company posted an earnings before interest, tax, depreciation and amortization margin of 6.2% during the quarter, trailing analyst expectations of about 10%. JLR however expects to sustain margins between 4% and 7% in the medium term, P. Balaji, group chief financial officer at Tata Motors, said in a conference call with reporters. He didn’t give any time frame. Apart from the slowdown in China, profitability and margins were hit by lower operating leverage due to a 7.7% drop in dealer dispatches, higher discounts in the US, UK and China, foreign currency fluctuations, and higher depreciation and amortization costs, according to Tata Motors. However, existing headwinds such as geopolitical factors, a model run down cycle, disfavour for its diesel-heavy portfolio and cyclicality in the US continue to persist as only five out of 13 JLR models posted growth during the June quarter. To address these challenges in the near future, JLR plans to grow volumes with new models, attain cost efficiencies and operating leverage, and manage capital expenditure “prudently", Balaji said. “Operating leverage needs to come back at JLR, so we will do whatever it takes to secure it. As the demand scenario clears up, capital will be aligned accordingly," he added. Analysts said the results were disappointing on a majority of parameters, and expect JLR’s performance to remain subdued in the near to medium term. Even the import duty reduction in China may not help matters much, said Mitul Shah, vice president (research), Reliance Securities, referring to lower price tags on JLR vehicles after the tax cut. “Apart from a number of overhangs in other markets for JLR, profitability in China will have to be gauged after the tax structure changes depending on the final price, though volumes will definitely be high in July," he said, adding that rising raw materials and incentives are a concern in an increasingly competitive market environment. Meanwhile, Tata Motors recorded a robust performance in its home market of India. The local operations swung to a net profit of ₹ 1,187.65 crore in the quarter from a year-earlier loss of ₹ 463.14 crore thanks to higher commercial and passenger vehicle sales. Sales climbed 63% to ₹ 16,592.33 crore, albeit off a lower base. The Ebitda margin widened 8.9 percentage points to 8.3% as higher sales of bigger trucks and buses improved net realisations. Tata Motors’ chief executive and managing director Guenter Butschek said he is satisfied with the company’s ongoing turnaround strategy for the domestic business and said he is “remains “positive on the long-term potential of the Indian market". Butschek however cited short-term challenges on the commercial vehicle front with implementation of new norms on axle loads. Total domestic sales rose 64% on-year to 164,579 vehicles in the June quarter. Commercial vehicles led the way, with sales of medium and heavy commercial vehicles doubling on launch of new product launches, higher industrial activity, robust consumption demand and government spending on infrastructure, the company said. Shah at Reliance Securities said the India’s economic expansion will help Tata Motors sustain growth in its domestic business helped by a strong product pipeline and the turnaround strategy. Ahead of the results, shares of Tata Motors fell 1.18% to ₹ 264.15 on BSE, underperforming a 0.3% rise in the Sensex, which touched a record high of 37,606.58 points.